~Dr. William F. Pepper, closing argument, King Family v. Loyd Jowers and Other Unknown Co-conspirators, December 8, 1999.
series consists of the closing argument presented to the Jury, and summarizes the case against the true murderers of Dr. King. On 9/11, luggage is “discovered” which contains evidence used to quickly build a case against Atta & Co. On 4/4, a bundle is dropped in front of an amusement shop in Memphis which contains evidence used to quickly build a case against James Earl Ray. A slight continuity error here, the bundle (including the rifle alleged to kill Dr. King) is placed before the shooting. On 9/11, the crime scenes were not cordoned off and forensically examined, with tons of steel sold off for scrap, the crime scene was tampered with. On 4/4, a sniper drops Dr. King, and brush that obscured the actual location of Dr. King’s killer is removed the next day, reinforcing the idea that Ray shot King from a different location. The crime scene was tampered with. The exercise was cancelled. According to testimony by covert asset Jack Terrell, a covert team with personnel from the Army’s 20th Special Forces Group, which had been training with Thirty-Ought-Six rifles, was en route to Memphis at the time of King’s assassination. The operation was cancelled before the team, or “group”, could take their positions. Special Forces have been known to conduct covert operations at the behest of the CIA. The media perpetuates the story to the present day. On 9/11, America’s security system “failed” miserably. This has led to the speculation that this was a failure by design, including the possibility of a “stand down” order On 4/4, the police security normally in place for Dr. King was definitely ordered to “stand down” according to testimony by Phillip Melanson. 9/11 was not an isolated incident. We can learn from preceding events. Arguably, all of the major assassinations in the United States during the 1960s were covert operations. (Peter Dale Scott has noted many similarities between JFK and 9/11.) Arguably, the 1993 WTC bombing, the OKC bombing, and 9/11 can be proposed as covert operations, and in this case, there is one CIA/FBI asset linking these three events, Ali Mohammed. William Pepper will be part of a new independent investigation of 9/11, should the NYC 9/11 Ballot Initiative succeed. * In my opinion, Pepper’s experience will guide the direction of the Commission in such a manner that they will be able to bring some truth to the American people, and indeed the world, about what happened on 9/11. The Commission will have subpoena power, and they will use it. Then it will be up to us to make sure that the Truth is on the lips and in the eyes and ears of all who can still reason, even after being bombarded with lies, deceptions and half-truths for years. “…this is an area where I had to consult with other experts because it turns out really to be a neurological function. — well… sort of like channels in the brain when certain things trigger certain collateral thoughts. “And when you associate one thing with another over time, just the mention of the one brings the association of the other. “What this will sometimes mean is that even when something is later exposed as a lie, if it was accepted as a truth for a long time, the exposure of it as a lie is not believed. I’m not a member of the Commission, and I can’t offer true insight about how it is operating in this early stage. However, after studying Pepper’s method in the MLK case, I can’t think of a legal professional more qualified to start stripping away the layers of lies and obfuscation that surround 9/11. to distribute a more impartial justice. Given the chance, however, I think Pepper will apply his skills as best he can, and this will mean trouble for anyone with secrets to hide about 9/11. Will he and the Commission make mistakes? Undoubtedly, but compared to the block of Swiss Cheese that the original 9/11 Commission left us, it would have to fail in a most spectacular manner to be a worse product. Please pass these links around, let’s try and make this April 4th, the last April 4th that Americans blame a patsy named James Earl Ray for the murder of Dr. King. VIDEO: Dr. William F. Pepper’s closing argument to the Jury, December 8, 1999. * It has been suggested that the New York City Council will not approve the Commission. According to the Ballot Initiative website, an additional 15,000 signatures will override the Council’s rejection, if required. In the eary 1990s Pepper was involved in a dramatization called “The Trial of James Earl Ray” made by the BBC, but not broadcast in the US, AFAIK. This is documentary footage shot by Pepper’s staff during the trial, fortunately, they used a MiniDV cam. The press neved really covered this trial, except some minimal coverage by Court TV, and hardly anyone knows about it to this day. The footage has been in the possession of Pepper for nearly ten years, waiting to see the light of day. In 1977 the family of Martin Luther King engaged an attorney and friend, Dr. William Pepper, to investigate a suspicion they had. They no longer believed that James Earl Ray was the killer. For their peace of mind, for an accurate record of history, and out of a sense of justice they conducted a two decade long investigation. The evidence they uncovered was put before a jury in Memphis, TN, in November 1999. 70 witnesses testified under oath, 4,000 pages of transcripts described that evidence, much of it new. It took the jury 59 minutes to come back with their decision that exonerated James Earl Ray, who had already died in prison. The jury found that Lloyd Jowers, owner of Jim’s Grill, had participated in a conspiracy to kill King. The evidence showed that the conspiracy included J. Edgar Hoover and the FBI, Richard Helms and the CIA, the military, the Memphis police department, and organized crime. 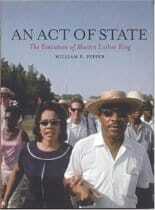 An Act of State with William Pepper, author of “An Act of State: The Assassination of Martin Luther King”, his second book on the King case. William Pepper was a close political associate of Dr. King’s in the last year of his life. Pepper represented James Earl Ray on appeal of his conviction for the murder of Dr. King. This presentation was given in Long Beach, California in January 2003, after the publication of the book. Part Two continues Pepper’s presentation, and concludes with a 45 minute question and answer session. The definitive account of the assassination of Martin Luther King Jr, published on the 40th anniversary of his death. Martin Luther King, Jr. was the most powerful and eloquent champion of the poor and oppressed in US history, and at the height of his fame in the mid-sixties seemed to offer the real possibility of a new and radical beginning for liberal politics in the USA. In 1968, he was assassinated; the movement for social and economic change has never recovered. The conviction of James Earl Ray for his murder has never looked even remotely safe, and when William Pepper began to investigate the case it was the start of a twenty-five year campaign for justice. At a civil trial in 1999, supported by the King family, seventy witnesses under oath set out the details of the conspiracy Pepper had unearthed: the jury took just one hour to find that Ray was not responsible for the assassination, that a wide-ranging conspiracy existed, and that government agents were involved. An Act of State lays out the extraordinary facts of the King story–of the huge groundswell of optimism engendered by his charismatic radicalism, of how plans for his execution were laid at the very heart of government and the military, of the disinformation and media cover-ups that followed every attempt to search out the truth. As shocking as it is tragic, An Act of State remains the most compelling and authoritative account of how King’s challenge to the US establishment led inexorably to his murder.